Apple won, by an extraordinarily wide margin, a battle with Samsung over the exclusion of portions of each other's expert reports. 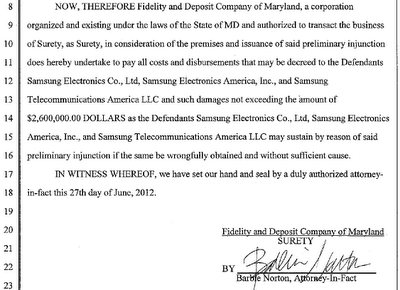 On this basis, the injunction has taken effect and Samsung must abide by it. Otherwise Apple could ask the court to sanction Samsung for contempt. Samsung later filed a motion to stay the injunction pending its appeal to the Federal Circuit. Samsung also asked the court for an expedited schedule to adjudicate its motion to stay. According to Samsung's proposal, Apple would have to file its opposition brief tomorrow, Friday, by noon local time. Apple actually would have been willing to agree on an expedited schedule but wanted to have until Monday for its filing. I frankly don't understand why Samsung didn't just accept Apple's proposal, given the difference of only one business day. Samsung's motion to stay argues that it's likely to succeed on appeal because the court "erred by issuing a preliminary injunction based on a stale and incomplete record" and the injunction "is improper based on the current evidence" (which Judge Koh did not allow Samsung to present at this stage). Samsung discusses the harm that it and "the public" would allegedly suffer from enforcement of the injunction and mentions again its relationships with wireless carriers. Ideally, Samsung wants a stay pending its entire appeal, but it alternatively (and more realistically) asks for a stay pending the CAFC's decision on its motion to stay (knowing that Judge Koh is certain to deny a stay pending the entire appeal). 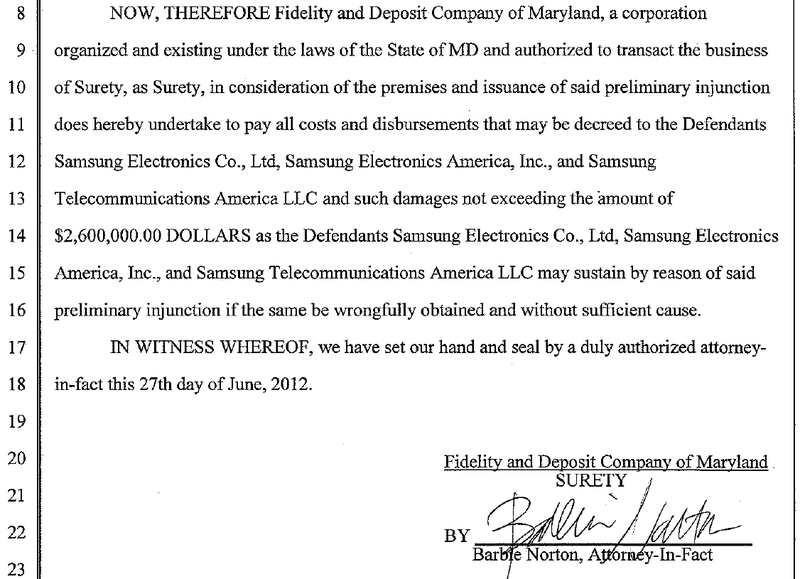 I don't want to overstate the merits of Samsung's appeal and its request for a stay. It's going to be difficult for Samsung at this stage. But I reiterate my belief that Samsung's arguments aren't entirely implausible. Just like I wrote yesterday, Samsung also notes that the CAFC actually wanted Judge Koh to perform another equitable analysis, but her order instead relied on the opinion of Circuit Judge O'Malley. It's possible that none of Samsung's "new" arguments have merit and that none of its new proposed pieces of evidence makes a difference. But if there's only one item that should have been and wasn't considered, then Judge Koh's decision to grant a preliminary injunction is less than waterproof. Since Judge O'Malley's position (that there was no need for a new equitable analysis as the record was supposedly clear) wasn't adopted by the majority of the CAFC, it can't necessarily be relied on. The safer alternative would have been to set a tight schedule and let Samsung produce its new evidence, to hear the parties, and to perform a new equitable analysis based on the latest record. In another battle that is relevant with a view to the trial that will start in about a month, Apple won by a wide margin a battle with Samsung over the parties' motions to exclude portion of each other's expert reports. In the greater scheme of things, this is just one of many steps in a litigation, but whether certain theories are allowed to be presented at a jury trial can make a difference. Magistrate Judge Grewal explains in his order that "expert trial testimony in patent cases is often far from perfect" and "[t]his case is no exception", but the court can't strike everything someone criticizes. In this particular case, "many of the expert reports offer theories or rely on evidence never previously disclosed as required", and that's the basis on which a number of motions to strike succeeded. a Samsung expert report arguing that Apple infringes the '516 patent. Apple did not succeed with respect to portions of Samsung expert reports on the claimed non-infringement by Samsung of the '915, '381 and '607 patents and on Apple's alleged infringement of the '460 patent as well as a supplemental damages report and a rebuttal damages report. But some of the denials came with an authorization of additional expert testimony. Apple won a total of five hours of additional depositions, while Samsung won only two additional hours of testimony. Samsung's own motions to strike portions of Apple's expert reports were much less successful than Apple's motions. Magistrate Judge Grewal denied certain Samsung motions related to Apple expert reports on the alleged infringement of the '381 patent, tbe alleged invalidity of the '711 patent, the alleged non-infringement of the '711 patent, an expert report on damages, an expert report on the importance of design to consumers (a cornerstone of Apple's argument in this case), and certain trade dress claims. Samsung succeeded only with a motion to strike portions of an Apple expert reports opining on alternatives to Apple's design patents and only with parts of such motions targeting Apple expert reports on the state of the art surrounding Apple's design patents (Samsung got certain references to devices stricken but Apple defended its references to reviews, comparisons and design elements) and the alleged infringement of the '607 patent (Samsung lost with respect to references to laboratory results but won with respect to "an infringement theory and evidence"). I have previously stated my belief that Apple goes into this summer's trial with a fundamentally stronger case than Samsung. That belief is mostly based on the strength of the asserted intellectual property rights and the fact that Samsung mostly relies on FRAND-pledged standard-essential patents (SEPs). Both parties have great lawyers, but no lawyer can change the fact that Samsung is in a strategically weaker position here. Apple won't be able to prevail on each and every intellectual property right it asserts, but I think Apple will at least win parts of its case while Samsung will at best win a FRAND royalty but no injunction over SEPs. Samsung's non-standard-essential patents don't appear frightening so far.